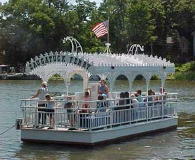 Spring 2006 Newsletter - Wickwood Inn - Saugatuck, Michigan - romantic Bed and Breakfast near Chicago. "Everything to excess. To enjoy life, take big bites. Moderation is for monks." Robert Heinlein, "Time enough for Love"
We can hardly wait until the local berries are sweet enough for eating!! Strawberries, raspberries, blueberries and blackberries. 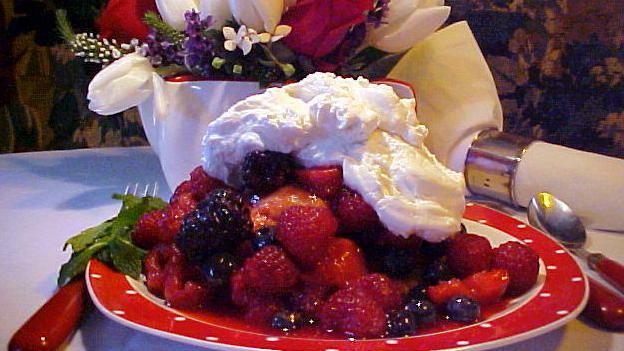 Well, we've been known to make a complete dinner of only Very Berry Shortcake!! taste the fruit, and resign yourself to the influences of each"
The wild onions and violets are sneaking through the damp earth in our orchard. Unmistakably, it's Spring! Every ingredient should be picked at its very best. We think that's what our guests deserve at Wickwood Inn. to life and inch toward the Spring sunshine. beach combing. Spring sunsets are superb. are soaring balls, practicing for the next Masters. The Annual Tulip Time in Holland is May 3rd through May 13th. Amidst the city wide display of tulips are the Volks parade, Street Scrubbing, Dutch Klompen Dancers in full costume, a Marketplaats, concerts with Three Dog Night, Frankie Avalon, The Oakridge Boys and the Zanggroep Choir. Fireworks too. Our favorite entertainer, Michael Holmes, performs his one man version of the �Judy Garland Show�. This cabaret featuring Judy, Carol Channing, Billie Holiday, and Bette Davis is just not to be missed. Such fun!! Your spirits will be lifted. Sculptures magically appear all over our village on June 3rd thanks to an extraordinary competition that allows us to enjoy the very best. Stone, metal, bronze, and marble are all in evidence. And, all around town everyone�s snapping photos. Join the welcoming reception for the artists at the Joyce Petter Gallery. Spring is a great time for antiquing. The shops and barns are filled with "finds" from country French to country Michigan - old bottles to wicker bassinettes. In Saugatuck/Douglas there's Amsterdam's where you might find an aging sign, Philip Stark chair or a clay pot you could live in. Bentley's has English silver and china painted shutters, French posters, and art. If you�re on your way to Spain - don�t miss visiting it�s oldest grocery store founded in 1868 and run by 5 generations of the same family. Located in Huesca at the foot of the Aragonese Pyrenees, Maria Jesus SanVicente�s shop draws visitors from around the world. It�s truly a food lover�s delight. True to its Broadway Theater roots, the Mason Street Warehouse, an uptown theater in downtown Saugatuck, has announced its 2006 season. It�s terrific entertainment! June 23 - July 9 �Hunka Hunka Burning Love, an Elvis Presley Musical Tribute� A celebration of Elvis� music not an imitation. A must read! �My Life in France� by Julia Child and her nephew Alex Prud' Home is just out. Now we can share with Julia how it all began. I first "met" her in 1968 when a pal gave me the just published �The French Chef Cookbook� and I cooked my way through it from start to finish. All 424 pages. She became real, twenty years later, when Julia, Paul and I were houseguests at Pat & Walter Well�s �Chanteduc� in Provence as we gathered to celebrate Pat�s 40th. The laughter started then ... and never stopped. Julia was the only person I know who called regularly after 11pm and before 6 am, with no apologies, ever. Wills could tell, as he came to the kitchen for his first cup of coffee, when I�d already been talking to her. Fun was in the air!! On a recent trip to NYC - during which the streets turned into grand parade of pink and white blossoms - I went to pig heaven. Nestled unasumedly on a corner in the West Village (my first and last home). The Pig is a local pub first and a culinary mecca second. That's why April Bloomfield (formerly of the River Caf� - London) got one coveted Michelin star when others went wanting. The lines are two hours long so, lunchtime is best. �The Force of Reason� ~ Oriana Fallaci (Author of �A Man� and �The Rage and Pride� - If you are alive today, a must read. �Eat, Pray, Love� ~ Elizabeth Gilbert. Adventures over one year in Italy, India and Indonesia. �Manual of Saint-German-des-Pres� ~ Boris Vian. The inside scoop. �The Vinegar of Spilamberto and other Italian adventures with food, places and people� ~ Doris Muscatine. A little trip. �Meat Club Cookbook - For gals who love their meat� ~ Vanessa Dina � Great fun. �Barbra (Streisand): The Way She Is� ~ Christopher Anderson tells all. �Body Transformation: Lose Weight, Gain Energy and Reverse Premature Aging� ~ Julie Chrystyns. Princess Diana of Wales endorsed this !Sigh! �The Herbal Kitchen� ~ Jerry Traundeld. Truly wonderful. April 10 The Golf Courses are green and open! "Just living is not enough. freedom, and a little flower." "You can fall in love at first sight with a place as with a person." Place no faith in tomorrow. For the the clock may then be still." Spring in NYC is glorious!! It comes early and blossoms are all over town. Blossoming too are taut bodies, pulled faces and more blondes and twins than natural. The streets are beginning to look funny. True confidence instead is very apparent, reflected in strands of silver hair and crow�s feet on heads held high..
George Bernard Shaw�s Orinthia in �The Apple Cart� declares that confidence in ourselves comes not from what we do or how we look, or how rich we are, but from a deep and complete acceptance of ourselves. The French call it �Jolie Laide� - women who radiate a kind of magnetism that goes beyond looks ... good or flawed. Remember ... Lady Liberty is green! �Plant a radish, get a radish never any doubt. These two buzzwords are everywhere in the food world! And, large producers are using them with abandon - Don�t bite. "Organic farmers" can�t use toxic pesticides, chemical herbicides or fertilizers and must be certified every year. In this case small definitely is better. And, nothing tastes as good as young, fresh produce. It will cut your time in the kitchen in half. If you don�t have your own garden; make your local farmers your new best friend. Find a road side stand, a farmer�s market, stop at a farm and start networking, join a farm co-op or guild, or best of all help a friend with a garden to weed. If you can, plant a few seeds on your own. So much the better. A couple of heirloom tomato plants, a sprinkle of arugula seeds or a few radishes. �Just picked� is perfect!